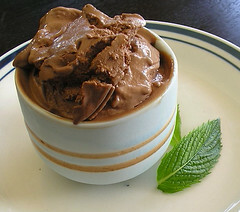 Bittersweet Chocolate Mint Ice Cream - Do You Know The Muffin Man? Notes: Used all half-and-half cream instead of whole milk and heavy cream. Followed variation using 72% bittersweet chocolate. Spearmint flavour is mild without the cooling quality of menthol (which is found in peppermint).